From Pezula, all around the Knysna lagoon to Brenton-on-Sea, homes have been destroyed. IVO VEGTER spent eight hours on the roads of Knysna. This is what he saw. By noon on Wednesday 7 June 2017, it was clear that Knysna was in trouble. Raging forest fires in dozens of locations were being fanned westward by the gale-force winds. No rain was in the forecast until Thursday morning. When it did come, it would prove to be too little, and far too late. The N2 highway in and out of Knysna was closed in both directions because of downed trees, utility poles, and fires that were out of control. Fire-fighting teams valiantly tried to contain the fires, but in many places were overwhelmed by the combination of drought-stricken vegetation, high winds, and lack of water. From the west, the town began evacuating. The rural areas along the Rheenendal Road were first. Then Belvidere, Brenton-on-Lake and Brenton-on-Sea were entirely cut off by road, as the fire raced across the Western Head from end to end. Residents there were evacuated by the NSRI and volunteers who braved the violent waters of the Knysna estuary in the gale. 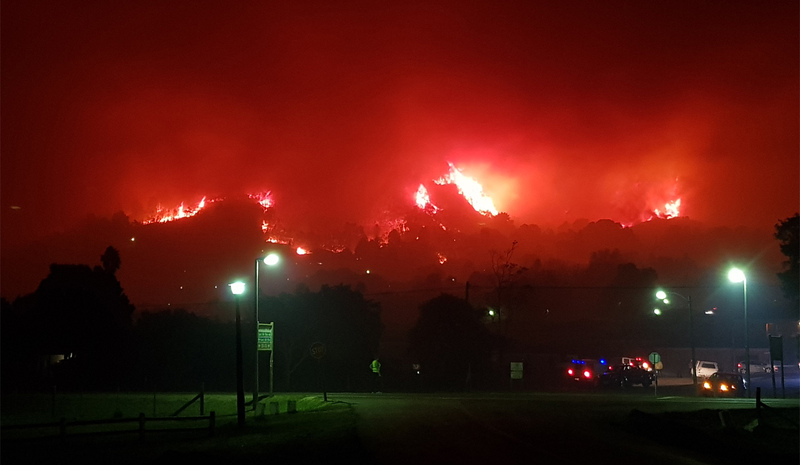 Later, it was the turn of suburbs around Eastford and Knysna Heights to evacuate, and the northern half of the Central Business District followed soon after. The entire town was enveloped in a thick pall of smoke and ash, which made it hard to breathe and made the eyes water. The Knysna High School hostel was on fire, and the Knysna Provincial Hospital was evacuated to the Knysna Life Private Hospital. Friends from the western side of town arrived at our house in Old Place, towards the east of town, by 6pm. They didn’t know whether they’d have a home to go back to. Only a few short hours later, the SAPS vehicles with megaphones ordered us out, too, and we joined the throngs of thousands of refugees: four adults, two children, three dogs, a cat and two hamsters. One of the hamsters didn’t make it, probably due to the acrid smoke in the air. As we left with a car full of valuables, emergency supplies, and pets, the approaching fire was ominously visible. A raging inferno was headed for our house. The roads were chock-a-block with traffic heading towards the water. We were able to flee to an empty holiday house on Leisure Isle, thanks to my partner’s job as a rentals agent. Most people weren’t so lucky, and had to spend the night in one of several evacuation centres in community halls, churches, and the local sports stadium. Many took shelter in their cars, parked by the side of the road near the water. Relief efforts were rapidly organised via social media. WhatsApp and Facebook groups co-ordinated streams of information, offers of help, evacuation notices, and distress calls. These became all the more important, to residents and officials alike, when the fire cut the town’s power and telephone lines. Among the reports were eyewitness accounts of deliberate arson. Theft and looting had started in various areas. A town in total darkness, save for the glow of wildfires all around it, is a terrifying place to be. Under the circumstances, cut off from outside help, the municipality, emergency services and the many residents who volunteered did an exemplary job of saving what could be saved. But many people watched their homes burn down. There was nothing anyone could do to stop the raging fires. The only option was to get as many people out alive as possible. Four people didn’t make it, and lost their lives to the fires. Many pets didn’t make it either. By the dawn, although the worst seemed to be over, some fires were still raging. Our group was lucky. Both our houses were still there in the morning. Many other Knysna residents – many of whom we counted as friends – were not so lucky, however. Some 200 homes and other buildings had burnt down. A survey of the damage around town brought home the enormity of the disaster. Smog was still hanging heavily over Knysna. We expected to see devastation on a drive through the townships, on the hills above the town, but to our surprise and relief we could not see much evidence of damage. The fires, vicious and fast-moving though they were, raged mostly through the wealthier suburbs of Knysna. One of the worst-hit areas was Knysna Heights. In many spots, half a dozen or more burnt-out ruins could be seen at once. Young families lost everything they had. The blood-red sun rose menacingly over the smouldering hills. The well-known landmark known as ‘The Doll House’ was now a spooky ruin. Dave McRae, marketing manager at the Knysna Elephant Park, raced home to save his valuables, but was thwarted by a tree that had fallen across the road. By the time helpful locals had cut the tree away, it was too late. Five years ago, he had lost his wife to aggressive cancer. “First my wife, now this. I must have been a very bad person in a previous life,” he mused, surveying the remains of his home. In places, Knysna looked like a war zone. Expensive vehicles were destroyed in their garages. A couple who had planned to move back to their home in Pezula Golf Estate at the end of July now have to walk in to this. Along the coast north of The Heads, coastal forests were still smouldering, threatening flare-ups that could endanger more, forest, wildlife and luxury homes. Not far from where we live, in the quiet middle-class suburb of Old Place, we found this house. Neighbours told me the owner had recently built it with his own hands. This must have been his living room. Many guest houses and holiday homes offered accommodation to displaced residents, but some were themselves claimed by the fire. Along the N2, where it snakes around the lagoon, lies what remains of The Idle Monkey B&B. A little further along, the Greenfire Lodge was completely burnt out. Only the frames of tables and chairs remain in the bar of the famous Knysna Hollow Lodge, along the road to Eastford. The guest rooms were entirely destroyed. Near the church in Old Belvidere, this once-charming house was gutted. Brenton-on-Sea did not escape the destruction either. After a day of driving around town, surveying the terrible toll the fires took, the sun was dipping towards the west. The weather had cleared, which allowed fire-fighting helicopters to take off for the first time, but that also meant there would be no more rain. Some of the smoky palls were getting thicker again. The realisation that it might not be all over weighed heavily on us on the drive home. All photographs by Ivo Vegter.